I was back in the pool this week, and it was so reassuring to know I had the tools to apply what you taught from the get go. 5 minutes of doing nothing and gliding and I was confident I could do all that I'd achieved last week, just in a different pool. With 20 years’ teaching experience, Cheryl makes the most of the one-to-one setting to help you get to grips with the fundamentals. She’ll help you take this knowledge and apply it to all aspects of movement in the water and the strokes, making them freer and easier. For Cheryl, swimming the strokes is about moving through the water in a free and effortless way, releasing tension and increasing mobility, rather than a means of exercising to ‘get fit’ or burn calories. Cheryl qualified as an ASA teacher just before completing the Diploma in Aqua Development and Health with Steven Shaw in 1999. 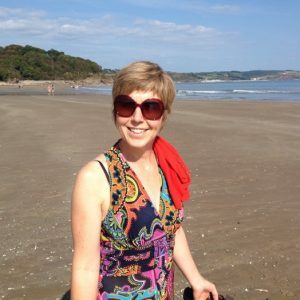 She has taught alongside Ian since this time, teaching adults and children on a one-to-one basis. A long-term lay practitioner of the Alexander Technique she’s very interested in how the body moves both in and out of the water. She finds the water a great place to apply its principles to movement. Subtle changes are clearer and rewards more instant. Over the years, working with others and on her own swimming, Cheryl’s developed a deep understanding of how we can move easily through water. 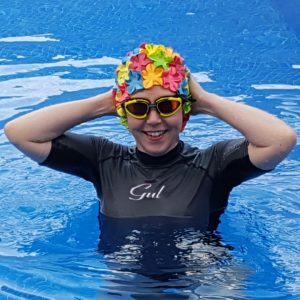 Her teaching of the strokes is based on fundamental principles which mustn’t be neglected as you progress, her favourite of which is “letting it happen rather than making it happen.” She is a dancing enthusiast and she feels that learning to dance has helped her own swimming become more fluid. When she’s not in the pool, during office hours, she can often be found in our garden studio running our online swimming shop. She’s always happy to give advice about swimming kit which will enhance your visits to the water.